Adam Levin has been praised by renowned American guitarist, Eliot Fisk, as a “virtuoso guitarist and a true 21st century renaissance man with the élan, intelligence, charm, tenacity and conviction to change the world.” Levin has performed across the United States at renowned venues such as Chicago’s Pick Staiger, Nichols, James Lumber Performing Arts and Mayne Stage concert halls, Boston’s Isabella Stewart Gardner Museum, Museum of Fine Arts, and Jordan Hall, Spivey Hall in Atlanta, Le Poisson Rouge in New York City. In Europe, Levin has performed in some of the finest venues across Spain, and in Italy, Germany, and Switzerland. Adam Levin’s live performances have been featured nationally numerous times on NPR’s Performance Today and on top radio stations WFMT Chicago and WCRB Boston. In the 2015-2016 season, Levin made solo appearances at Boston GuitarFest in a program highlighting composers of Spain, as well as concerts in Pittsburgh, Detroit, Kansas City, Knoxville, Des Moines, South Bend, Chapel Hill, Richmond, and San Jose, plus international tour appearances in Canada, Spain, and Puerto Rico. Levin also made his Kennedy Center debut in November, 2015, in a diverse solo and chamber program presented by Pro Musica Hebraica, featuring the Amernet String Quartet and mezzo-soprano Rachel Calloway, praised by the Washington Post as “a visceral and imaginative performance.” Levin appeared as a special guest artist in new music programs with the Quantum Ensemble of Spain, and a concert featuring the music of Leonardo Balada (with the composer present) with Ensemble Concept/21 at Indiana University South Bend. From 2008-2011, Levin was honored as a Fulbright Scholar as well as grant awards from the Program for Cultural Cooperation Fellowship (promoting cultural understanding between Spain and the United States) and the Kate Neal Kinley Fellowship, to research contemporary Spanish guitar repertoire in Madrid, Spain. His three-year residency resulted in a major collaboration with 30 Spanish composers spanning four generations, who each wrote works commissioned by and dedicated to Levin. In 2012, production began on a four volume encyclopedic recording project with Naxos. The first recording in the series, 21st Century Spanish Guitar, Volume 1, was released by Naxos in 2013 to rave reviews from Classical Guitar Magazine, Soundboard, American Record Guide, Scene Magazine and both Recording of the Month and Recording of the Year awards from MusicWeb International. 21st Century Spanish Guitar, Volume 2 will be released by Naxos in October, 2016, with special solo concerts scheduled in Washington, DC (presented by the Spanish Embassy and National Fulbright Alumni Association), the Chicago Latino Music Festival at the Art Institute of Chicago, and New York’s Le Poisson Rouge. Levin’s critically acclaimed discography also includes his debut album, In the Beginning [ALR, 2009], Music from Out of Time [La Communidad de Madrid, 2010] featuring world-premiere solo and chamber works by contemporary Spanish composers; and Fuego de la Luna [Verso, 2011] showcasing the complete guitar works of Spanish-Cuban composer Eduardo Morales-Caso. An avid chamber musician, Levin has performed with orchestra, string quartet, and various instrumental and vocal duo combinations. His primary chamber ensemble, Duo Sonidos, has been celebrated for bringing a fresh interpretation of chamber music to wide-ranging audiences across the globe while expanding the repertoire for violin and guitar through new commissions. In 2010, Duo Sonidos was awarded first prize at the Luys Milán International Chamber Music Competition in Valencia, Spain. Their 2010 self-titled debut recording received rave reviews from Classical Guitar Magazine, Soundboard, American Record Guide, Fanfare, and included a US Choice award from BBC Music Magazine. The duo also will record their second disc featuring folk‐inspired works by Béla Bartók, Xavier Montsalvatge, Karol Szymanowski, Lukas Foss, Jorge Muñiz, and other newly arranged works by Gregg Nestor. With their commitment to perform also in non‐traditional venues, Duo Sonidos will also present a special program of works by Jewish composers and non‐Jewish composers inspired by Judaism across the United States. As an ambassador of the guitar, Mr Levin is dedicated to sharing a comprehensive repertoire in underserved and unconventional spaces. He was director of the Concert for Golf Coast Aid for Hurricane Katrina victims, which raised $10,000. In 2007, he was awarded the Albert Schweitzer Fellowship to conduct 200 hours of innovative community work in Boston public schools, prisons, and rehabilitation centers. Demonstrating his long-term commitment to music advocacy, Levin and acclaimed guitarists, Matthew Rohde and Scott Borg, launched Kithara Project (www.kitharaproject.org) in 2015, a non-profit organization devoted to promoting the widespread and equitable access to the guitar worldwide. A native of Chicago’s North Shore, Adam holds bachelor’s degrees from Northwestern University in Music Performance, Psychology, and Pre-Med. Under the tutelage of Eliot Fisk, Levin completed his master’s degree in guitar performance at New England Conservatory in Boston. His esteemed teachers have included Oscar Ghiglia, Gabriel Estarellas, Anne Waller, Mark Maxwell, and Paul Henry. Adam is the director of the annual Boston Young Guitarists’ Workshop (www.ygwboston.org), which will expand to weekends throughout the academic year culminating in the Boston Guitarfest. Levin is on the faculties of the University of Rhode Island and the University of Massachusetts at Boston. 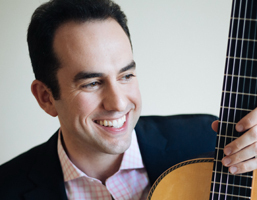 Adam Levin is a D’Addario Artist and performs on a guitar by luthier Stephan Connor.